Description: Flying troop that deals area damage. Baby dragons hatch cute, hungry, and ready for a barbeque. The Baby Dragon is a good unit that doesn’t have too many counters for its elixir cost. This card is used in high arena(6+) decks at the moment. He offers AoE splash damage and is great against small troops. Baby Dragon + Giant – Place your Giant in the back. Once the Giant reaches the bridge, drop your Baby Dragon and maybe more ranged/melee troops depending on their reaction. Baby Dragon + Knight – Not as strong as the Giant one, but works just fine and will give you some elixir to defend. 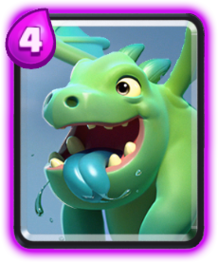 Baby Dragon + Giant Skeleton – This combo annihilates any troop rushing deck. The Giant Skeleton will drop a bomb and kill all small troops. Use this combo once you know they run a lot of small troops. Musketeer – A great counter as she can take her out for the same elixir cost. Tombstone – This is used to distract the Baby Dragon. It takes a few hits to kill the tombstone, allowing your crown tower to take it down before it can deal damage to the crown tower. Archers – Requires to be behind either the crown tower or a tank in front. Otherwise, you will lose the trade. 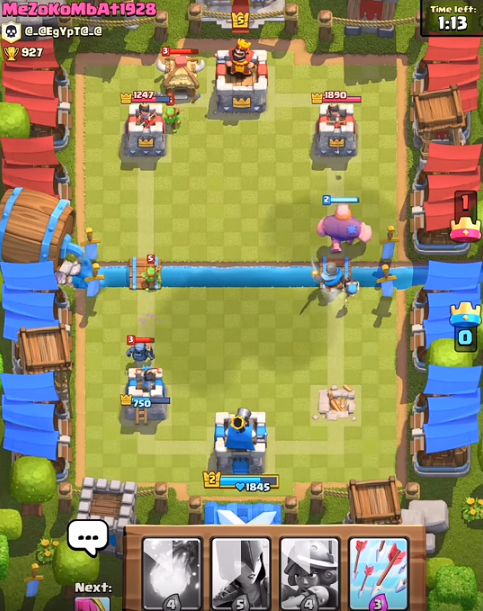 Tesla – A well placed Tesla 3 blocks below the center of your base will kill the Baby Dragon with some left over health. Inferno – Kills the Baby Dragon quick, but at the cost of 5 elixir. Use this only if they run big units like Skeleton King, Giant or PEKKA.